Rebuilds a Shape by making pre-defined substitutions on some of its components. Supports the 'BRepTools_History' history by method 'History'. The kinds of the replacements. Applies the substitutions requests to a shape. <until> gives the level of type until which requests are taken into account. For subshapes of the type <until> no rebuild and futher exploring are done. NOTE: each subshape can be replaced by shape of the same type or by shape containing only shapes of that type (for example, TopoDS_Edge can be replaced by TopoDS_Edge, TopoDS_Wire or TopoDS_Compound containing TopoDS_Edges). If incompatible shape type is encountered, it is ignored and flag FAIL1 is set in Status. Returns modified copy of vertex if original one is not recorded or returns modified original vertex otherwise. Returns the history of the substituted shapes. 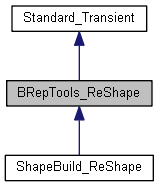 Checks if shape has been recorded by reshaper as a value. Tells if a shape is recorded for Replace/Remove. Merges the parts to the single product. The first part is replaced by the product. The other parts are removed. The history of the merged shapes is presented by equal ways. Returns (modifiable) the flag which defines whether Location of shape take into account during replacing shapes. Sets a request to Remove a Shape whatever the orientation. Sets a request to Replace a Shape by a new one. Replaces the first shape by the second one after the following reorientation. the first shape is oriented forward. If <last> is False, returns status and new shape recorded in the map directly for the shape, if True and status > 0 then recursively searches for the last status and new shape. Returns the new value for an individual shape If not recorded, returns the original shape itself If to be Removed, returns a Null Shape Else, returns the replacing item.